Bellbrook senior running back Sedric Ferguson crosses into the end zone for a 34-yard touchdown run. 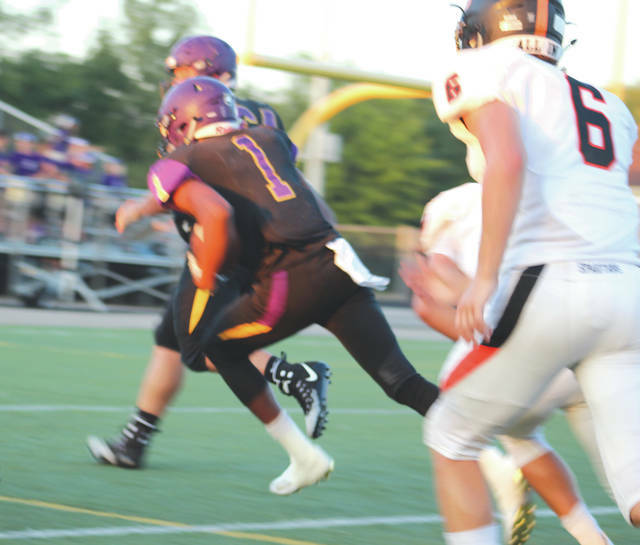 BELLBROOK—The Bellbrook Golden Eagles advanced to 4-0 on Friday, Sept 14 as they continued to perform well without key players due to injury. They dominated against their Southwestern Buckeye League Conference foe, the Waynesville Spartans (now 2-2) defeating them by a score of 49-7. The Eagles’ defense nearly held on for a third shutout in a row. However, they gave up a 30-yard TD on the Spartan’s last possession of the game. In four games, Bellbrook’s defense has now only given up 16 points. Despite, giving up the last score, the Eagles seemed to do whatever they wanted for most of the game. They scored 42 of their 49 points in the first half before pulling most of their starters. Eagles QB senior Brendan Labensky played well throwing for two TDs. The Eagles rarely had the need to pass the ball, however. Instead, they continuously rushed for long plays. On the Eagles’ first possession, senior Sedric Ferguson ripped a 66-yard touchdown to set the tone for the game. The Eagles ended up with five TDs on the ground. Freshman Cameron Strong got the only score of the second half when he ran for a 51-yard TD. “We had a decent lead and I felt comfortable putting our twos in there,” Jenkins said. According to joeeitel.com, Bellbrook came into the game leading the OHSAA Division III, Region 11 rankings in computer points. Official rankings come out next week and this season looks like it could turn into a solid year for a team trying to make it to the playoffs for the second time since 2004. Bellbrook will play its next game at home against Franklin at 7 p.m., Friday Sept 21.